Post 2 members Christopher Hanson, James Landman, and Steven Fraase sang the National Anthem at the Military Appreciation Night at the RedHawks baseball game on June 29th. The Post 2 Color Guard also was a part of a massed Color Guard during pre-game festivities. We hope to get some photos of the Color Guard soon! Post 2 Executive Committee members Larry Lein (left) and Dave Johnston (right) along with Sergeant at Arms Jeff Hett (center) represented the American Legion at the Fargo Marathon during the the 5K Heroes Run and Walk yesterday! The trio of racers were representing the Post 2 Color Guard. Outstanding job, gentlemen! Congratulations to Dakotah Hoselton and Brooklyn Klein of AFJROTC, Fargo Public Schools! Dakotah received the American Legion JROTC Military Excellence Medal while Brooklyn received the American Legion JROTC Scholastic Excellence Medal! Both awards were sponsored by Post 2 with Past Commander Michele Olson presenting the awards! 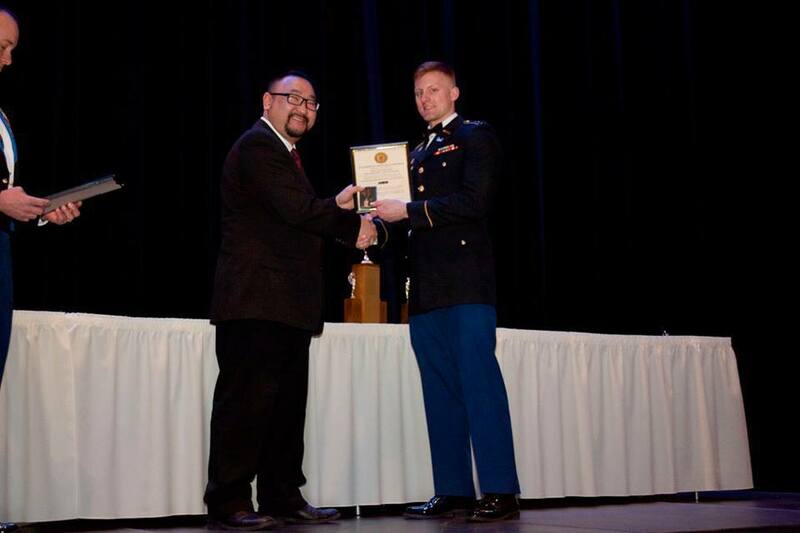 Check out some photos of Post Commander Christopher Hanson and Adjutant Sylvan Melroe presenting ROTC Awards to the Bison Battalion back on February 11th! Veterans Service Officer Tom Webb (left) observes as Veterans Service Officer Supervisor Bryan Watters (center) accepts a donation from Commander Christopher Hanson (right). Last night at the February Post Meeting, Commander Christopher Hanson presented a check for $850.87 to the North Dakota Department of Veterans Affairs to to go into the North Dakota Support Our Veterans Fund! This fund was the Commander's Project for his 2015-2016 membership year. Present to accept the check was NDDVA Veterans Service Officer Supervisor Bryan Watters (also a Post 2 member) and Veterans Service Officer Tom Webb. The North Dakota Support our Veterans Fund was established to provide resources for emergency needs of North Dakota veterans and their eligible dependents. Emergency needs of veterans may include but are not limited to dental care, vision, hearing, housing, transportation for medical treatment and other special needs as approved by the Fund Advisors. We're happy to know that this money will be put to good use aiding veterans and their families and hope to make a donation sometime again in the near future! 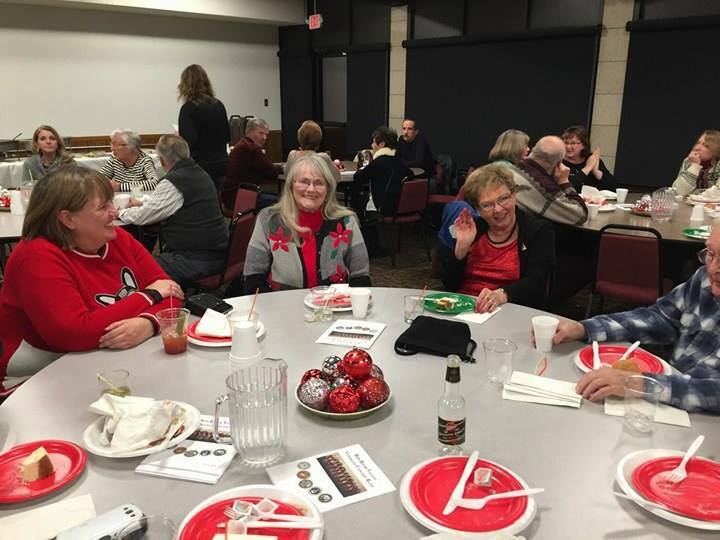 Here's a few photos from the American Legion Christmas Party (courtesty of Dave Johnston) which took place on December 13th at the El Zagal Shrine! Thanks to Auxiliary for putting on this excellent event! 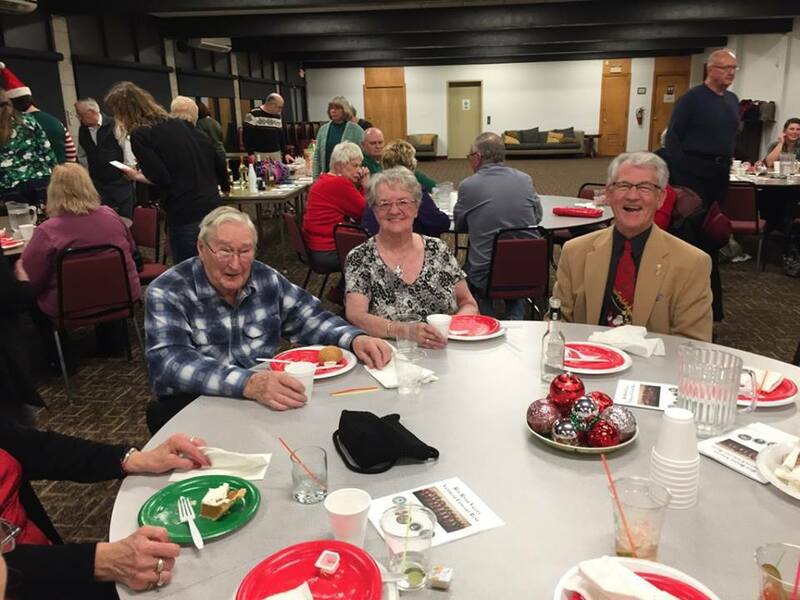 November Post Meeting - Helping Our Youth! At our November Post Meeting, we had the pleasure for a second month in a row hosting youth that Post 2 have helped grow and mature as future leaders in our community! 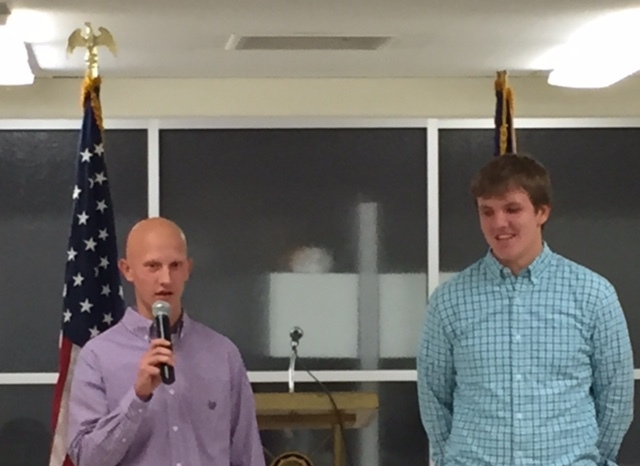 Two more young men spoke at the meeting sharing their experiences at their time at Boys State this past June. As always, they were very excited about what they brought back home with them- knowledge of how our country is managed, experience and understanding on what our political system is made of, and valuable leadership experience that will no doubt help them in the future. 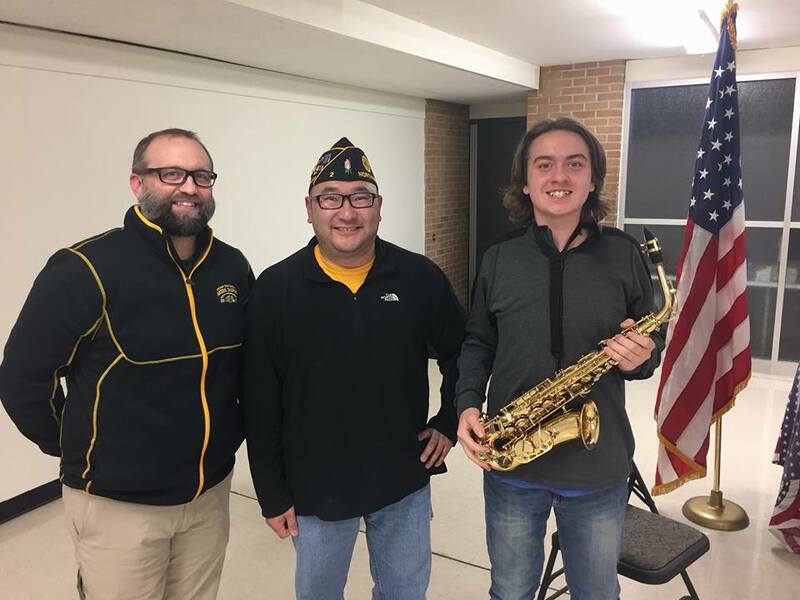 We also had the chance to visit with Ben Diers, a freshman saxophone instrumentalist, who was the recipient of a scholarship to attend the International Music Camp this past summer. Ben performed the Star Spangled Banner for us to open our meeting and then sat down and visited with us on his experience at the camp. This was special for Commander Hanson as he, a professional musician in the Fargo-Moorhead area, began his musical journey by attending over a dozen sessions of camp at the International Music Camp in his middle school and high school years. Post 2 will continue to strive to aid our youth in becoming better leaders and citizens in our community by providing them with these outstanding opportunities! 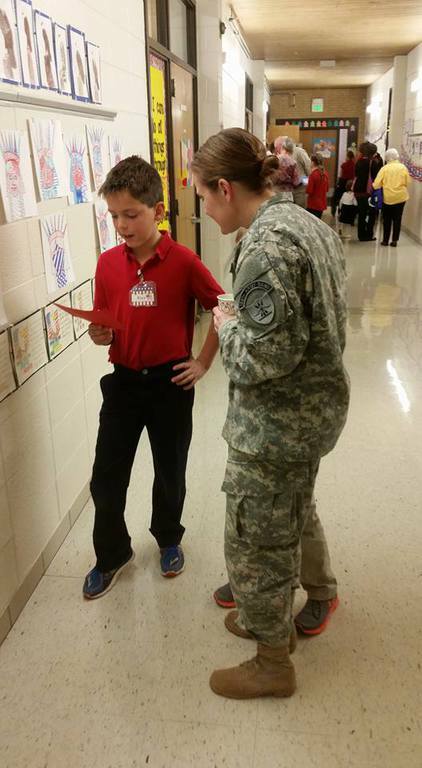 Thank you to all of the volunteers who helped make Veterans Day a success for Post 2! Without your help, we couldn't enjoy such a special a day, a day to remember all of our Veterans who have served out country with honor! Thank to the member of Post 2 and Unit 2 for their help in getting everything ready foir the Stew Feed. Thanks to the Red River Valley Veterans Concert Band for their outstanding performance that afternoon! Thanks to the American Heritage Girls for providing so much help with bussing tables, serving beverages, and more during the afternoon events. And thanks to the El Zagal Shrine for allowing us to host this event at that great location! 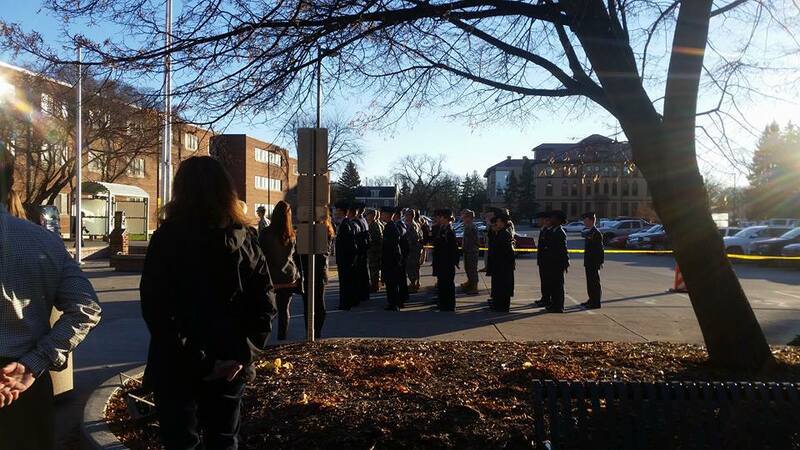 Other Veterans Day celebrations around the area included a Veterans Day Ceremony which took place at North Dakota State University outside of the Memorial Union. 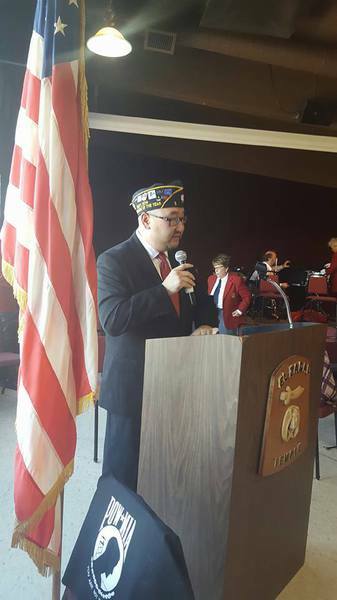 The event was spearheaded by the Veteran Alliance Organization (VALOR) and featured a ceremonial raising of the flag, Taps, and a speech by Past Commender of Post 2, Brad Aune. 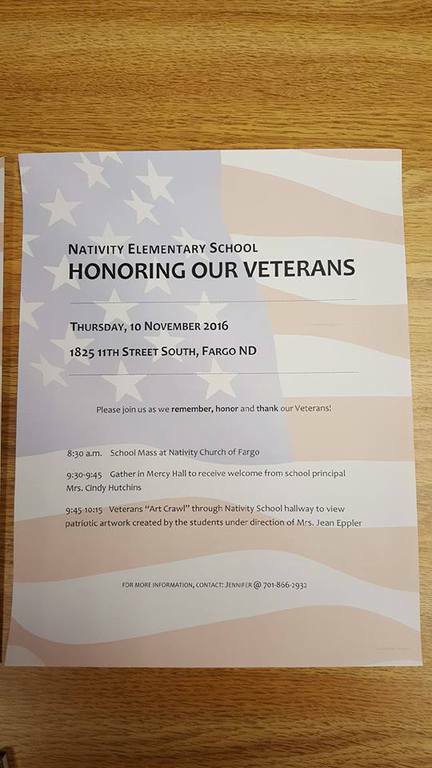 A wonderful tribute to veterans was held at Nativity Elementary as well featuring displays of uniforms and military items, artwork by the students, and presentations by groups of children of all ages. 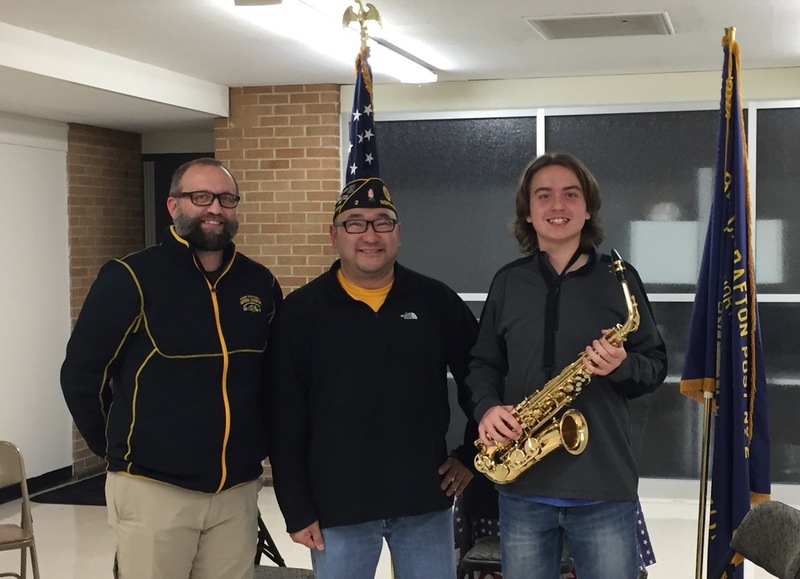 Instrumental in the event were Post 2 members Edward Schwind, a Marine Corps veteran, and Jennifer Schwind, a currently-serving member of the North Dakota Army National Guard and a combat veteran having served overseas in the Middle East. The Schwind's have six children, three of which are currently attending school at Nativity Elemntary. A 9/11 Ceremony was held on the Memorial Bridge between Fargo and Moorhead on September 11th. Various Color Guards were in attendance at the ceremony- in this photo, we see members of the Post 2 Color Guard along with VFW Commander David Rice. The Post 2 Color Guard pauses for a photo opportunity with Past Commander Cathy Keogh. Thanks to the boys who stopped by our October Post Meeting to talk about how 2016 Boys State had an effect on them that will last a lifetime! Thanks also to the family members who were also in attendance! Pictured above: Wayne Warmager (Post 2 and District 1 Boys State Coordinator), Conner Beckman - Fargo North, Neelay Patel - Fargo Davies, Matthew Seefeldt - Fargo Shanley, Thomas Smallerz - Fargo South, Jensen Walker - Fargo Davies, Ivan Wognin - Fargo North, and Christopher Hanson (Post 2 Commander). Erik Benson - Fargo North, Bryant Everest - Fargo South, and Charles Thielman - Fargo North. 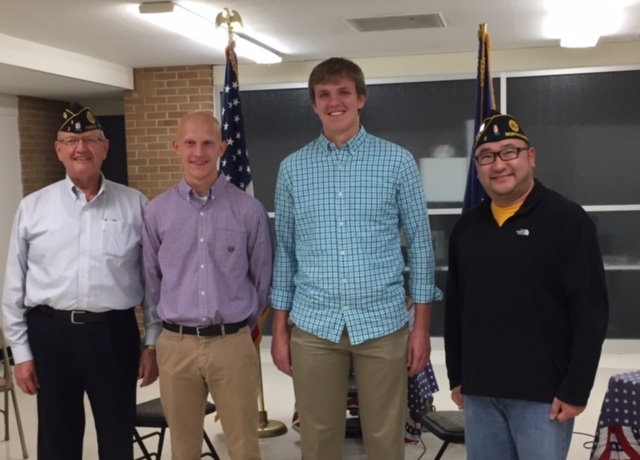 Congratulations to all of our 50, 60, and 70 year members of the American Legion! At our May Post Meeting, we had four our own members who were able to be in attendance to receive their awards! Thank you for your service to our country and your service to Post 2! 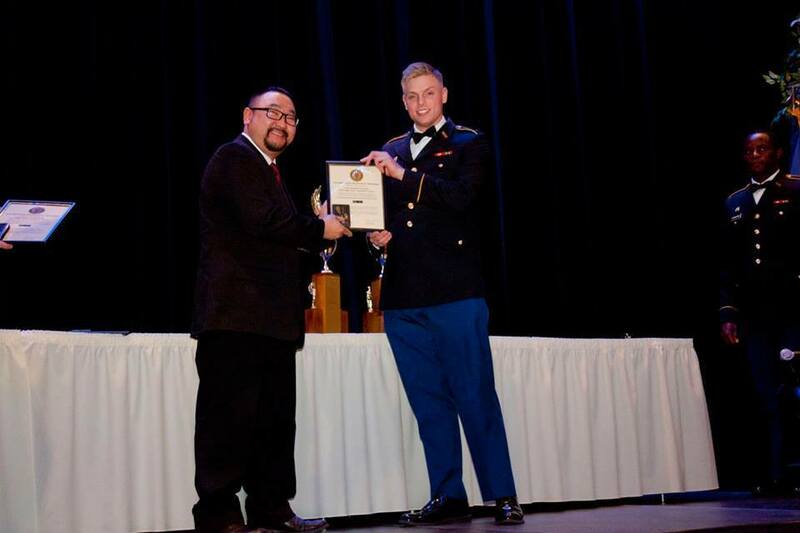 American Legion Post 2 had the honor of presenting awards for outstanding military leadership and scholastic achievment at the Bison Battalion ROTC Military Ball earlier this month. Post 2 members Syl Melroe, a member of the Executive Board and John Chatelain, Second Vice Commander were on hand to present the awards. The Military Excellence Medal, this year being presented to two Cadets, is awarded to Cadets for being in the top 25% of their ROTC classes and demonstrating outstanding qualities of military leadership, discipline, character and citizenship. 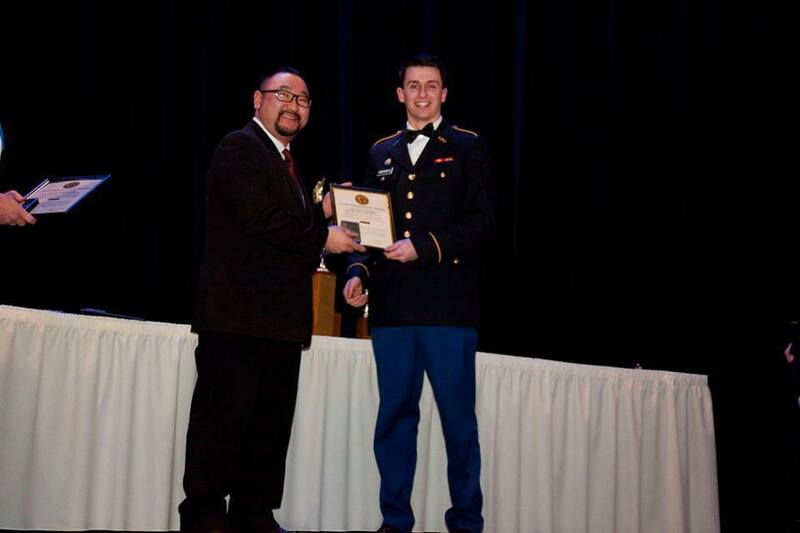 The Scholastic Excellence Medal, this year also being presented to two Cadets, is awarded to Cadets for being in the top 10% in their class in academic studies, the top 25% of their class in ROTC subjects, have demonstrated qualities of leadership, and have actively participated in related student activities such as student organizations, constructive activities, or sports. 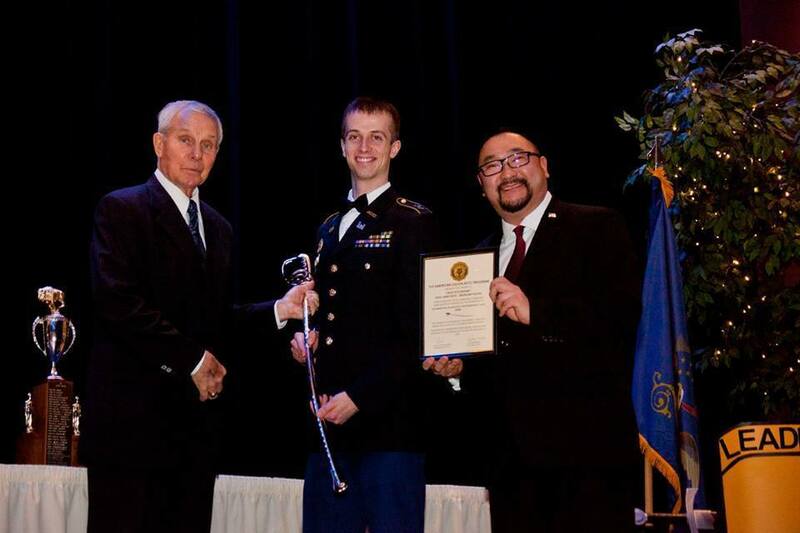 The final and most prestigious award we present annually is the Fargo American Legion Post 2 Saber, awarded to the top Cadet in the ROTC program. Commander Christopher Hanson got the honor of visiting with a Post 2 Baseball player, a Major League catcher, and a World Series Champion at the Post 2 Baseball Hall of Fame Banquet! Chris Coste served as the keynote speaker at the annual event. Former Post 2 Baseball player, Major Leage catcher, and World Series Champion Chris Coste gives his remarks at the Post 2 Baseball Hall of Fame Banquet. Past Commander Linda Whaley, Post 2 Commander Christopher Hanson, and Past Commander Cathy Keogh pose for a photo at the Post 2 Baseball Hall of Fame Banquet. 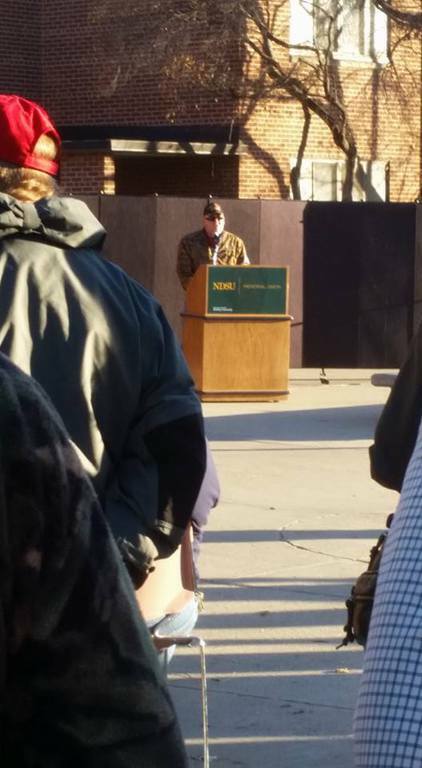 Commander Christopher Hanson speaks at the NDSU Veterans Day Ceremony in front of the Memorial Union. Commander Christopher Hanson served as the Keybote Speaker for the Fargo-Moorhead Veterans Day Ceremony at the Fargo Civic Center. 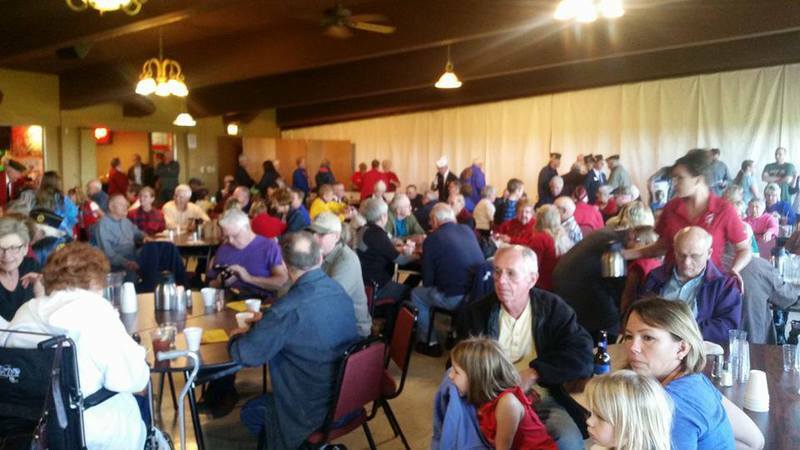 Veterans Day Stew at the American Legion. Commander Christopher Hanson participates in the POW/MIA Table Presentation. Post 2 members gather at the Memorial Bridge on Veterans Day for a short ceremony put on by the Vietnam Veterans of America. 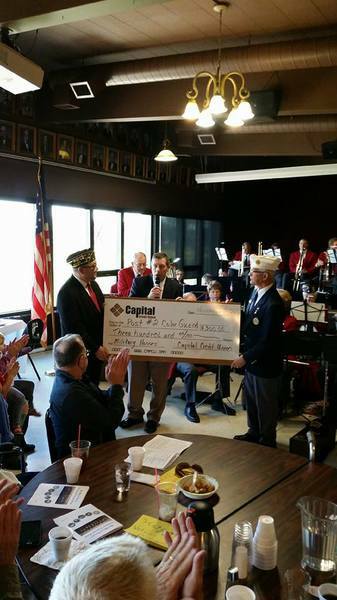 Check presentation to the Post 2 Color Guard from Jim Schafbauer and Capital Credit Union. Longtime Post 2 Color Guard bugler Konrad Olson was presented a bugle for his contributions to the program. Commander Christopher Hanson with the girls of the American Heritage Girls. Thank you for the youth who were in attendance at our combined Post and Auxiliary Meeting in November! Your stories and testimonials about your experiences at Boys and Girls State were outstanding. You should all be very proud of your accompishments at Boys and Girl State! Several Color Guards, including our very own Post 2 Color Guard, were out at the airport to welcome the Honor Flight back to Fargo. The Governor proclaimed June 20-26, 2015 Navy Week in the state of North Dakota. Here's a copy of his proclamation! 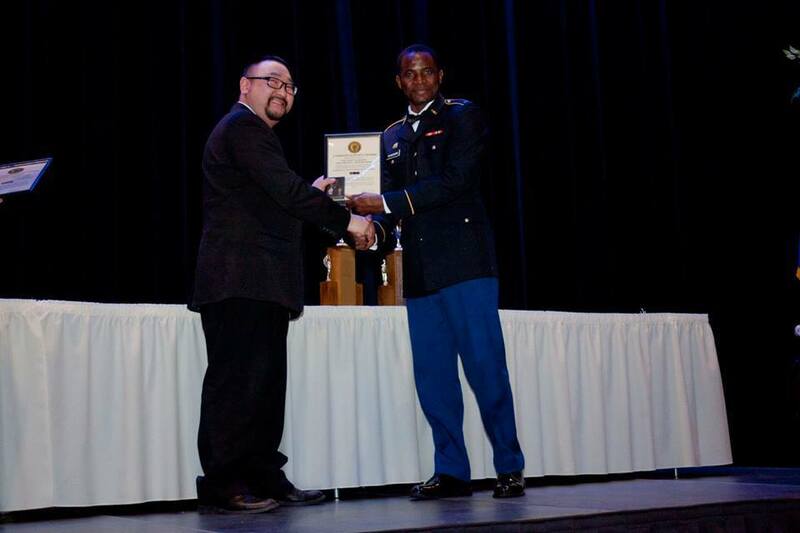 Commander Christopher Hanson made a donation to the children of the NDNG Military Youth Music Camp this past weekend. The donation, given on behalf of Post 2, was used to pay for free activities during Saturday recreation time. American Legion Post 2 and American Legion Auxiliary Unit 2 members volunteered to answer phones for Prairie Public Television on December 7th. Volunteers from the American Legion and the American Legion Auxiliary volunteer countless hours at the VA Medical Center each year. Commander Michele Olson speaks about the American Legion at the 2014 Jass Festival which took place August 10th and the Fargo Post. Congratulations to Commander Michele Olson, the new commander of Post 2. She and the other 2014-2015 officers were installed on Tuesday, June 3rd. Choice Financial presented Post 2 with a donation of $628 in honor of May being Natioinal Military Appreciation month! Past Commander Brad Aune accepted the check on behalf of the post! Michele Olson presents an American Legion ROTC award at a Fargo South AFJROTC ceremony at Fargo South High School. David Johnston presents the American Legion Military Excellence Medal to West Fargo High School JROTC cadet Justice Bowers. Megan Larson of West Fargo High School JROTC receives the American Legion Scholastic Excellence Medel from David Johnston of Post 2. The Post Commander looks pretty sharp! Commander Brad Aune along with his lovely wife Brandi were in attendance at the NDSU Bison Battalion ROTC Military Ball this past Saturday. Commander Aune presented medals and a sabre at the ball. About sixty Legion members, family members, and prospective members came out for chili on St. Patrick's Day weekend at the Legion. 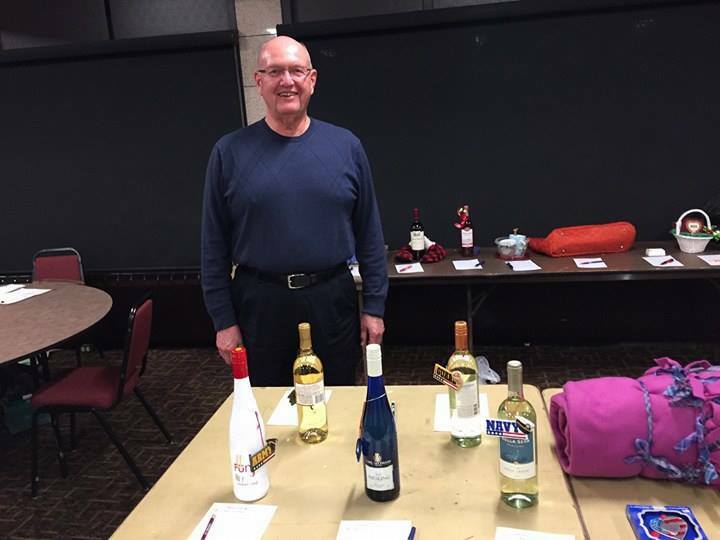 Mike Haugen was the winner of the chili cookoff with his delicious elk chili. 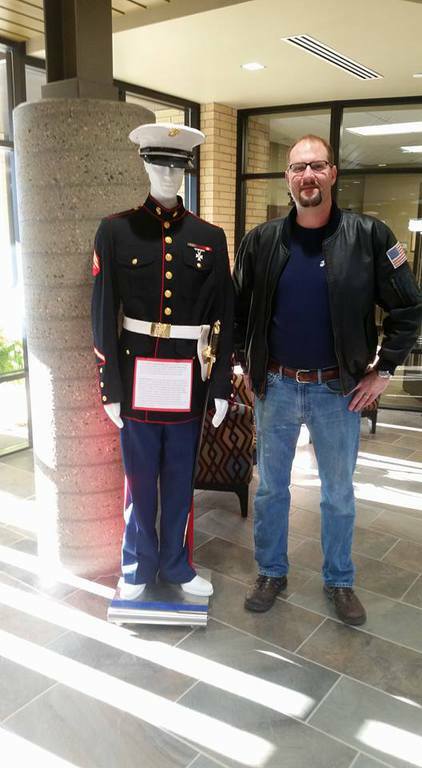 The chili cookoff was put together by Post Adjutant Christopher Hanson. Hanson took third in the voting with his chili. Post 2 members, Past Commanders Linda Whaley and Cathy Keogh along with current First Vice Commander Michele Olson pose for a photo prior to a performance with the Red River Valley Veteran's Concert Band. In this photo, the Post 2 Color Guard posts colors at the South Fargo Walmart on Veterans Day weekend. The local Walmart hosted a short ceremony and honored our veterans with an Honor Wall display. Hank Deyle and Michele Olson ride the bus out to the Cities to take in a Vikings game as part of the annual Past Commanders Football Trip. The POW/MIA table was set up for the Stew Feed to help ensure that everyone knows that we NEVER FORGET. Girls of the American Heritage Girls fill salt and pepper shakers in anticipation of the start of the Stew Feed. Post 2 Adjutant Christopher Hanson tests the stew to ensure that it is fit for consumption. Post 2 member Eddie Schwind stands proudly at attention for the playing of his service song, "The Marines' Hymn". The American Heritage Girls volunteered to help with the serving of the meal during the annual Stew Feed. In this photo, the girls take a break to pose for a photo with Commander Brad Aune. 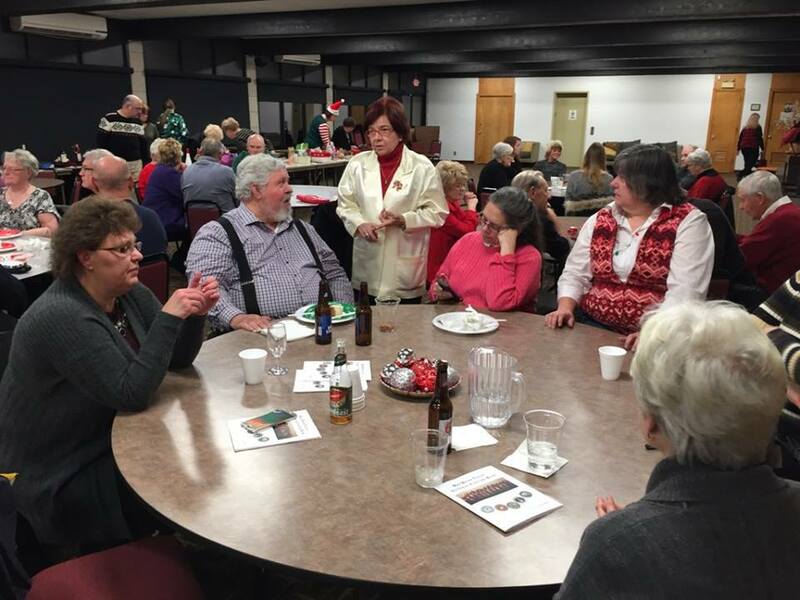 The crowd enjoys music by the Red River Valley Veterans Concert Band. Legion volunteers prepare the meal for the annual Veterans Day Stew Feed. 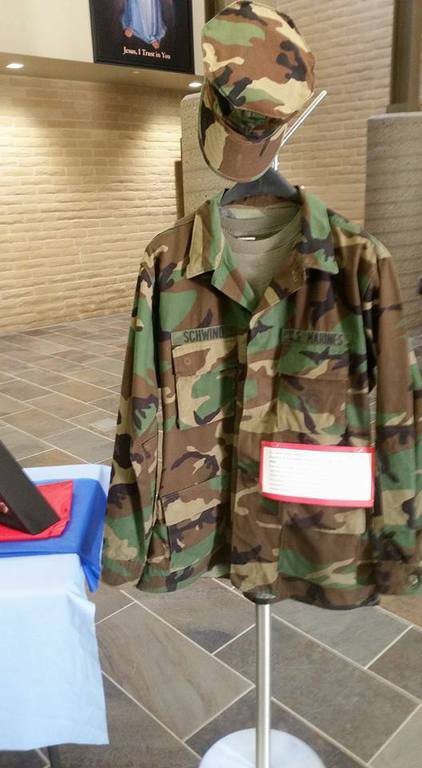 First Vice Commander Michele Olson and Past Commander Cathy Keogh cleaned and reorganized the Legion display cases outside of Legacy Ballroom during the November Field Day. Commander Aune, representing Post #2, attended the VA Native American recognition event at the VA Medical Center on July 17th. The 7 tribes in the region of the Fargo VA presented their nation's flags to the VA for display. Post #2 hosted a Veterans Round Table on July 3rd which was organized by Commander Aune and attended by several veterans and organizations. Pictured above is Commander Aune with Sen. Heidi Heitkamp. Commander Aune recently presented a check to Karinn Davidson at the Fargo VA Center. The money was collected over the year at post meetings by passing a helmet. The money will benefit the Healing Gardens project. Post 2 Baseball and American Legion Post 2 volunteers and members sold burgers in downtown Fargo last week as a part of the downtown classic car night on Broadway. Post 2 Baseball also hosted an exhibit, a model of the USS North Dakota. Post 2 Commander Brad Aune speaks to the audiene during a break at the Jass Festival. Post 2 hosted the festival for a second year in a row enjoying excellent weather and great crowds. American Legion Post 2 member Eddie Schwind (left) and Post 2 Adjutant Christopher Hanson (right) perform as a part of the 2013 Jass Festival which took place on the outdoor stage at the American Legion on August 10th and 11th. 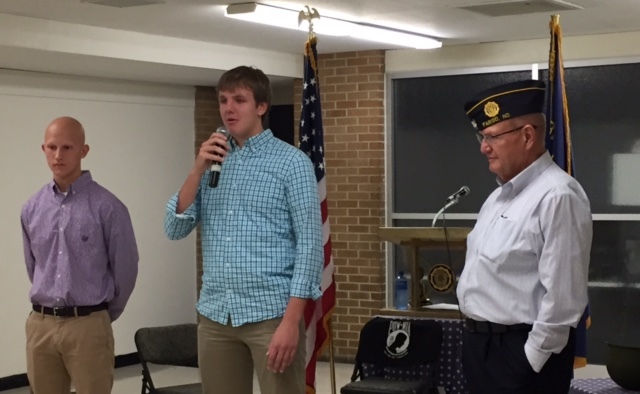 Dave Johnston presents American Legion awards to young cadets of the Fargo South High School JROTC on May 11th. State Commander Dave Rice installs the 2013-2014 Post Officers for Post 2 on June 4th. Congratulations to Robert Jacobson on the occasion of his election as 40 and 8 Chef de Gare of Locale 240 for the 2013-2014 year.